NASHVILLE, TENN., AUGUST 31, 2016: Hit songwriters Deric Ruttan and Craig Wiseman were honored at a party held at the ASCAP offices on Music Row to celebrate the success of Warner Music Nashville recording artist Blake Shelton's 22nd (and 17th consecutive) #1 song, "Came Here to Forget," produced by Scott Hendricks. The song marked the third #1 for Ruttan, whose previous chart-toppers include Shelton's 2013 hit "Mine Would Be You." Wiseman celebrated his 26th #1 with "Came Here to Forget," and was also congratulated for his 25th #1 song, "Gonna," the fourth and final single from Shelton's ninth studio album, Bringing Back the Sunshine. NASHVILLE – Eric Church, Maren Morris, and Chris Stapleton top the list of final nominees for “The 50th Annual CMA Awards” with five nominations each. This year’s finalists represent the depth and range of Country Music over the past five decades from soulful traditionalists to contemporary groundbreakers. NASHVILLE, TN (August 30, 2016) – Tonight, the Academy of Country Music hosted the 10th Annual ACM Honors™, an evening dedicated to celebrating special honorees and off-camera category winners from the 51st Academy of Country Music Awards. Portions of the event, which was held at Nashville’s historic Ryman Auditorium in Nashville, TN, were taped for a two-hour special that will air on Friday, September 9, 2016 at 9pm ET/PT on the CBS Television Network. Luke Bryan performs his No. 1 hit "Drink A Beer" with just him and his guitar in front of a sold-out crowd at the iconic Wrigley Field. The fans responded by lighting up the stadium with their cell phones. NASHVILLE, Tenn – (August 30, 2016) – This past Saturday, four-time Entertainer of the Year, Luke Bryan performed for the first time at the iconic Wrigley Field in Chicago, home of the Chicago Cubs. This marks the third stadium and fourth sell-out (including two nights at Gillette Stadium) for Bryan this year, so far. View highlights from the show HERE. NASHVILLE, Tenn. (August 29, 2016) - Making his debut on the Top Country Albums chart, Drake White has much to celebrate with the release of his new album SPARK (Dot Records). "...insanely talented and always impresses…" (Sounds Like Nashville), Drake’s 12-track labor of love came from years of hard work and dedication to perfecting his sound. It is available now at digital retailers. Dolly Parton’s Pure & Simple Debuts At #1 Worldwide! For The First Time In The 25-Year History Of SoundScan! Nashville, TN – August 29, 2016 – World-renowned singer/songwriter/entertainer Dolly Parton has a worldwide #1 album to celebrate this week. The superstar’s new release Pure & Simple debuts at #1 not only in the U.S., but, also on the national country charts in Canada, U.K. and Australia. Nashville, TN - Aug 29, 2016 - As rising singer/songwriter Tucker Beathard edges closer to notching over 200 shows this year, it could be easy to get lost in the momentum of the road. This weekend however, marked the scoring of a personal goal, as Beathard took the stage at the first-ever concert at Iowa’s Kinnick Stadium on Saturday (8/27). "For the Beathards, family is life” (ESPN) and Beathard’s performance was a full circle moment, as the venue’s day job is hosting Iowa Hawkeyes games, where his brother C.J. plays starting quarterback. FOXBOROUGH, Mass. (Aug. 28, 2016) – “The ups, the downs, the road, the shows – have been leading to… this moment,” Kenny Chesney told the crowd of 61,242 partway through “Beer In Mexico,” his second night set opener at Gillette Stadium. With his six-piece band rumbling like a ’72 muscle car, the the 8-time Entertainer of the Year’s 14th and 15th sold-out shows closed his Spread the Love 2016 Tour with a vengeance. Swindell was greeted and surprised by his team with a plaque to celebrate his Platinum-certified "You Should Be Here" having reached 1 BILLION+ audience impressions. Cole had just closed his Opry set with the career-defining song he came to the Opry to perform in honor of his Dad's birthday. NASHVILLE, Tenn. – (August 24, 2016) – Platinum-selling recording artist and record-breaking five-time No. 1 hit maker Cole Swindell had one of his best days yesterday – his late Dad’s birthday. Wrigley Field, Chicago – August 27th – SOLD OUT! NASHVILLE, Tenn – (August 22, 2016) – This past weekend, reigning CMA Entertainer of the Year, Luke Bryan made history by being the first artist to play at U.S. Bank Stadium in Minneapolis, MN, the new home of the NFL’s Minnesota Vikings. The sell-out crowd numbered 50,000. View an excerpt from the show HERE. NASHVILLE, TN - Aug. 22, 2016 - As Thomas Rhett continues “pushing up against Country’s music boundaries” (Associated Press), his sophomore release TANGLED UP (The Valory Music Co.) follows the same path earning PLATINUM certification by the RIAA. On Saturday (8/20), before his set as direct support on Jason Aldean's SIX STRING CIRCUS TOUR in Irvine, CA, Thomas Rhett was surprised backstage by his team and friends with news of the new benchmark. "You Look Like I Need A Drink"
NASHVILLE, Tenn. (August 22, 2016) – After a whirlwind release week filled with sold-out shows, once-in-a-lifetime fan experiences and late night adventures, JUSTIN MOORE has much to celebrate as his fourth studio album KINDA DON’T CARE (The Valory Music Co.) notches the #1 spot on the Billboard Country Albums chart. The project features his newly minted Top 5 single “You Look Like I Need A Drink” and also earned the singer his fourth Top 10 All Genre debut, landing at #4 on the Billboard Top 200 chart. The Poyen, AR native showed no signs of slowing down with a packed show in his home state before continuing to Nashville, TN, Charlotte, NC, Harrisonburg, VA and Indianapolis, IN for intimate performances of his new music as well as his most popular hits. 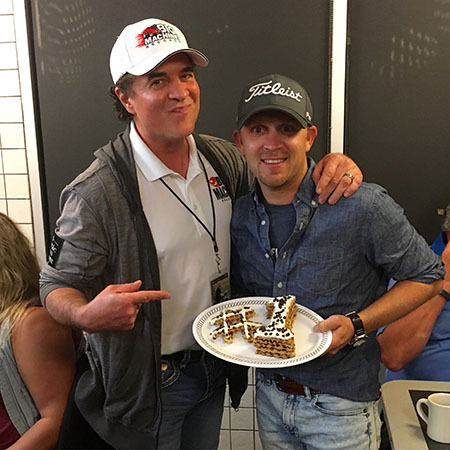 The platinum-selling singer then celebrated post-show by cooking up some of his favorite dishes at Waffle House® locations in each market. With a few more words, he invited the full-capacity crowd to sing along – something they’d been doing all night anyway – then launched into 2004’s “I Go Back.” The crowd’s response was deafening as they sang along to the song-invoking smash about the way music watermarks people’s lives. AUGUST 16, 2016 -- First off, it was a bucket list moment when her music idol Eric Church recently invited her to open one of his few select shows this year at Denver’s majestic Red Rocks. But, when singer-songwriter Cam was asked to join superstar Church for the performance of his hit, "Like Jesus Does," at the end of his sold-out show that night, the country newcomer could only recall a few musical memories that will surpass this one. Cam has looked up to Eric Church for some time. "I've belted out his songs in my car for the past four years, and his album Chief hasn't left the car since it came out," she recalls. "So to find myself actually harmonizing with Eric ONSTAGE and not in my car, the two of us sharing a spotlight, surrounded by the unreal vibe of Red Rocks," continues Cam, "that's a memory I'll carry with me forever." NASHVILLE, Tenn. – (August 15, 2016) – Platinum-selling recording artist and record-breaking five-time No. 1 hit maker Cole Swindell is celebrating again with the continued success and emotional impact of his fifth No. 1 hit “You Should Be Here.” His career-defining single just surpassed over 1 BILLION audience impressions (Mediabase audience: 979m, On-demand audio/video streams: 53m, digital track sales: 714,000+) including 25 million streams of the video on his own YouTube channel alone. The single has achieved more than 1 MILLION track equivalent sales. The Georgia native tops his own record with his multi-week No. 1 single “You Should Be Here” and becomes the only solo artist in the history of Country Aircheck/Mediabase to top the chart with his first five singles. 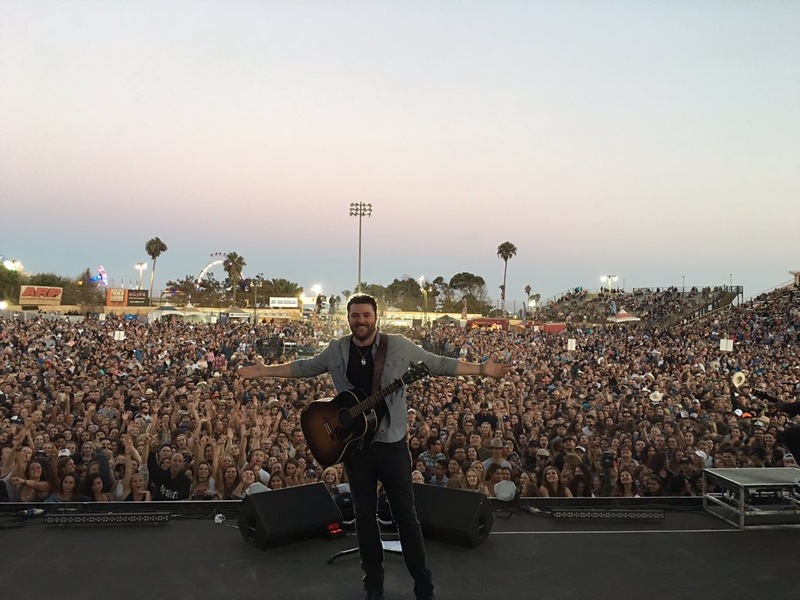 Nashville, TN — CHRIS YOUNG headlined a string of three sold-out shows across California last week, kicking off the run at the Ventura County Fair where the nightly concert quickly found itself at capacity, with the biggest crowds this year and a line out the gates to get a glimpse of the show. NASHVILLE, TN - Aug. 15, 2016 - RIAA’s top digital country male artist of all time Jason Aldean proves to be "one of Country music’s emblematic superstars" (Hits Daily Double) as his SIX STRING CIRCUS TOUR continues to “live up to his hype and record success” (Kansas City Star). Stamped as one of Pollstar's "Top Global Tours,” the multi-Platinum entertainer continues to host sold-out amphitheaters throughout the country marking over 58,000 fans this past weekend on a West Coast run. On the road, fans have a sneak peek of new music from his seventh studio album THEY DON’T KNOW (Broken Bow Records) available Sept. 9, while those who pre-ordered the album receive bi-weekly instant downloads of new tracks. NASHVILLE, TENNESSEE (August 15, 2016) Following the success of the 2015 Brad Paisley Country Nation College Tour, the country music superstar will bring his free concerts to a new group of IMG College partners this fall with support from presenting sponsor Frontier Communications. NASHVILLE, Tenn. (August 14, 2016) Carrie Underwood and the co-writers of her #1 hits “Heartbeat” and “Church Bells” celebrated the double success with music industry executives, family, and friends this past Thursday in downtown Nashville at the historic Bell Tower. “Heartbeat” was written by Carrie, Zach Crowell and Ashley Gorley, and was produced by Zach Crowell. “Church Bells” was written by Zach Crowell, Brett James and Hillary Lindsey, and produced by Mark Bright. MORRISON, Colo. (Tuesday, August 9, 2016) – With the camera lens so close it was reflected in his signature aviators, Eric Church spoke directly to his fans just minutes before taking the stage for his first of two solo shows at the majestic Red Rocks Amphitheater alerting the thousands watching via Facebook Live as well as the sold-out crowd of his plans to tour in 2017. He revealed that his North American 60+ city run, the aptly titled Holdin’ My Own Tour, will officially launch on Jan. 13, 2017 at Lincoln, Neb.’s Pinnacle Bank Arena and include stops in Chicago, Ill., Los Angeles, Calif., and will conclude with two nights at Nashville, Tenn.’s Bridgestone Arena in May. For the first time ever, there will be no support act on this tour. Eric Church and the ECB will play two full sets with an intermission in between. In an effort to ensure his core fans get great tickets at face value, Church is revamping the pre-sale and on-sale process to eliminate scalpers from the equation. NASHVILLE, TN - Aug. 08, 2016- NBC's national broadcast of the 2016 Summer Olympics just announced multi-Platinum entertainer Dierks Bentley will celebrate the start of the NFL season and the Denver Broncos Super Bowl championship, with a special live performance during the first 2016 NFL KICK OFF PRESENTED BY HYUNDAI (NBC & NFL Network at 7:30P ET on 9/8). Developing “a rapport with his fans as a live performer that artists possessing 10 times as much headlining experience can’t boast,” (Charlotte Observer) Bentley will be featured throughout the 60-minute pre game show along with One Republic from Sports Authority Field at Mile High in Denver, as he helps launch the season opener between the Carolina Panthers and Denver Broncos, in a rematch of Super Bowl 50. WHITE SULPHUR SPRINGS, W. Va., Aug. 6, 2016 /PRNewswire/ -- Homes for West Virginia, in partnership with SBP, today announced donations totaling $1,750,000 from three organizations with state ties at a groundbreaking ceremony in White Sulphur Springs. Mylan's gift of $1,000,000; a $500,000 donation by MedExpress, part of Optum, a UnitedHealth Group company; and Brad Paisley's initial donation of $250,000 from his #WVFloods GoFundMe account will provide early funding to launch Homes for West Virginia and its first initiative – Homes for White Sulphur Springs. Homes for West Virginia's total fundraising goal is $20 million. NASHVILLE, Tenn. – (August 8, 2016) – Dan + Shay (Dan Smyers and Shay Mooney) amplified the excitement surrounding this weekend’s 2016 Olympic Games’ commencement when they stopped by ABC’s Good Morning America this morning, to rally the crowd with an elevating performance of “The World’s Greatest” interspersed with clips of patriotic fans and athletes from across the country. View the powerful performance HERE. NASHVILLE, TN - Aug 08, 2016 - Hillary Scott & The Scott Family top the Billboard Top Christian Albums chart and secure the No. two postion on the Billboard Top Country Album's chart this week with the critically acclaimed debut album LOVE REMAINS (EMI Nashville), after moving over 31,000 units in its first week. Its "heart-stopping" (Rolling Stone) lead single "Thy Will" also claims the No. One position on Billboard's Hot Christian Songs for the second week while dominating Billboard's Christian Digital Songs for its eight consecutive week. Nashville, TN - Jake Owen’s highly- anticipated fifth studio album, American Love, debuted at No. 1 on Billboard’s Top Country Albums chart and at No. 4 on the all-genre Billboard 200 chart. Nashville, TN (August 5, 2016) – Big Loud Records breakthrough artist Chris Lane’s sizzling debut album GIRL PROBLEMS is too hot to handle on its release day. On sale today (August 5), the genre-defying stunner offers jaw-dropping falsetto vocals with a modern R&B-meets-country twist. Lane’s irresistible “Fix” is currently approaching the coveted #1 spot at country radio and has already surpassed a whopping 22 million streams on Spotify and 4.5 million views on Vevo. NASHVILLE, TN – Rockefeller Plaza will be “Doin’ It To Country Songs” on Friday morning as country music superstar Blake Shelton takes over the Today Show Summer Concert Series. Armed with the biggest selling country album release of 2016 with the critically acclaimed, If I’m Honest, Shelton will perform several songs from the new record including the new single “She’s Got A Way With Words,” and “Came Here To Forget.” Look for him to include a few classic songs as well.